Comprehensive training in new-age selling skills and techniques that make selling effortless, enabling you to inspire more people to buy more often. In some instances, these techniques have doubled and even tripled income, in businesses all over the world. Access to the most up-to-date sales techniques, teaching you how to become a Sale Authority so you can smash your targets. Six modules that are all delivered in an easy-to-use online format, so you can quickly learn the new skills and techniques to become a Sales Authority. 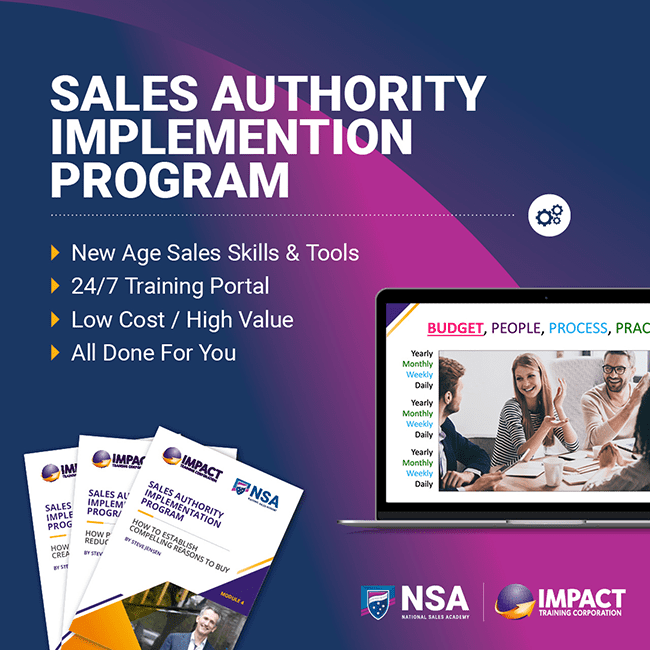 Our exclusive Sales Authority practical workbook containing all the new scripts, prompts and sales tools, designed to help you maximise implementation and, therefore, generate impressive sales results. Just $397 - valued at $1297! Sales tips and strategies from sales and business experts from around the globe, which you can implement immediately into your own business. Access to monthly Q&A sessions, ensuring you can have any and all your questions answered by leading sales experts and business specialists. Access to private coaching calls to keep you accountable and to ensure your training remains personalised every step of the way. Access to the most up-to-date selling tools that work, which will help you manage your KPIs, drive yourself and your team, and give you the confidence to inspire more people to buy more often.